[toc]Freckles are melanin pigmentations on the skin. These brown spots may appear due to excessive sun exposure. Genetic factors also play a role in the development of freckles. While wearing sunscreen and preventing overexposure to the sun are important factors in preventing freckles, certain natural herbal remedies can also be used to restore the skin to its normal appearance and eliminate freckles. Some of the best herbs for curing freckles are Cranberry, Parsley, Aloe Vera, Chamomile, Lady’s Mantle, Horseradish, Solomon’s Seal, Calendula and Witch Hazel. Most of these herbs smoothen and lighten the skin thereby removing the freckles. 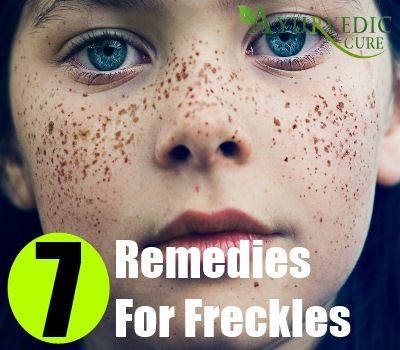 In this article, we will cover some of the best herbal remedies for curing freckles. Do consult a good dermatologist for chronic skin problems. The botanical name of this herb is Alchemilla Vulgaris. This herb is most well known for its ability to cure women health issues and gynecological problems. This herb is also good for softening and lightening freckles. In order to ensure that freckles fade and disappear, you can extract the juice of freshly crushed Lady’s Mantle leaves. This juice should be dabbed onto your skin and left to dry. After the juice has dried on your skin, rinse your face with lukewarm water and pat your skin dry using a soft towel. You can also use the leaves of this herb to infuse hot water or carrier oil such as Olive oil and use this as a lotion for your skin, to ensure the removal of freckles. This herb should be tested on small portions of your skin before you use it for treating freckles. This herb is well known as a skin lightening herbal remedy. Chamomile is known botanically as Matricaria Recutita. This herb is very effective for lightening freckles. It also makes the skin smooth, soft and supple. One of the best aspects of this herb is that it can also help to lighten the complexion. Due to this reason, it is used in a variety of skin care and cosmetic products. Chamomile tincture can be mixed with hot water and then dabbed onto a cotton ball. You can apply the tincture mixed with water onto your skin for freedom from freckles. 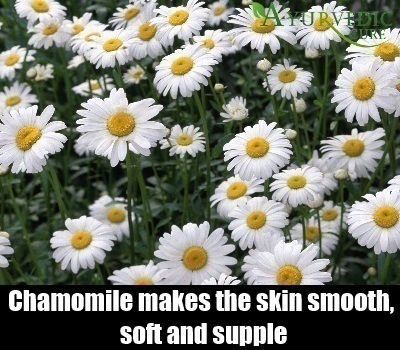 Chamomile is also available in the form of ointments and skin creams for ready application. Chamomile leaves can be infused in hot water or carrier oil such as Olive oil and left in a sealed jar for 2 to 3 days. This enables the oil or water to absorb the properties of the herb and heal the skin ridding it of warts, freckles and blemishes. You can dab the infused water or oil onto a cotton cloth and use it to apply the herbal remedy on the freckles for quick relief. Horseradish is popular as a skin bleaching and whitening agent. This herb is also very good for lightening freckles. You can mix some Horseradish with Apple Cider Vinegar, Lemon juice and Rosemary oil. Lemon juice contains citric acid which is well known for its ability to lighten freckle marks. Apple Cider Vinegar is also good for bleaching the skin. Rosemary oil softens the skin. You should apply this herbal mixture on the freckles to ensure complete and lasting relief from this skin problem. You can also grate some Horseradish leaves and mix these with yoghurt. Apply this paste onto your skin directly for getting rid of freckles. 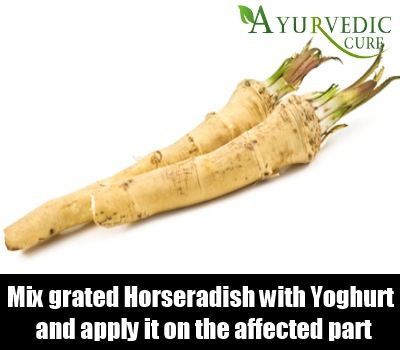 Make sure you check to see if Horseradish is safe to use on small patches of your skin first before trying this herbal remedy. Horseradishes are natural bleaching agents that lighten freckles. Polygonatum Odoratum is the botanical name of this herb. 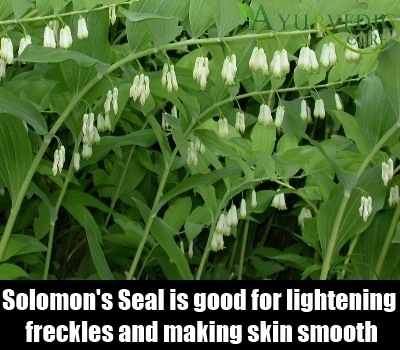 It is also known as Solomon’s Seal, Lady’s Seals, Sigillum Sanctae Mariae, Sealwort and Saint Mary’s Sea,. This herb is also good for lightening freckles and making your skin smooth. It also helps to ward off blemishes after freckles have formed. You should take the fresh leaves of this herb and dry them for a few days. Then, you should boil the dried leaves in hot water and strain the water from the top of the boiling vessel. The liquid should be dabbed onto the skin where the freckles have developed. The regular use of this herbal remedy will ensure the elimination of freckles. Parsley is a well acknowledged culinary herb. Petroselinum Crispum is the botanical name of this herb. It is quite effective for lightening freckles as well. Take some Parsley juice with equal parts of orange juice, lemon juice, and red current juice and mix the ingredients well. The freckles ridden area of your skin can be washed using this herbal face wash. You can also apply this mixture onto your skin and let it dry. Then, use lukewarm water to wash the paste off. 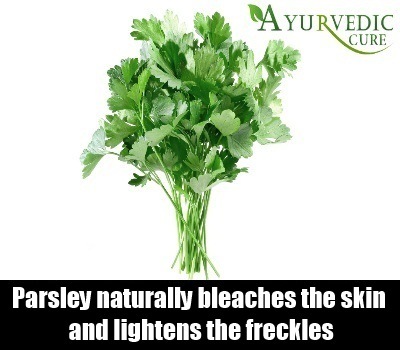 Parsley soothes the skin and heals the freckles. The high amounts of citric acid in some of the ingredients of this mixture also naturally bleaches the skin and lightens the freckles. Cranberry is also a good herbal remedy for freckles. The berries of this herb are rich in antioxidants which heal the skin and whiten the dark brown freckle spots. Cranberry fruits can be crushed into a paste and applied directly on the skin where the freckles are located. The juice of the berries of this herb can also be applied on the freckles. Once the juice or paste has dried, you can wash it off with lukewarm water. The after effect of using this antioxidant rich herbal remedy is that it can revitalize and rejuvenate your skin and remove the freckles. Cranberry is also essential for whitening the skin due to the presence of antioxidants such as ascorbic acid in it. Calendula Officinalis is the botanical name given to this herb. 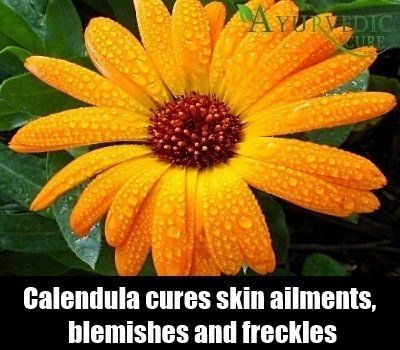 Calendula is also referred to as Pot Marigold. This herb is quite effective for curing skin ailments, blemishes and freckles. It is so useful for this purpose that it is often used as a raw ingredient in salves, ointments, creams and lotions for the skin. Calendula infused oil can be made by immersing the leaves and flowers of this herb in a jar full of Olive oil or any other good carrier oil. This jar should remain sealed for 3 days and then opened. The oil should be applied on the freckles for lightening them and restoring softness to the skin.